Description: NS 7004 pushes this beat up machine onto a side track, out of the way of the busy yard switchers. 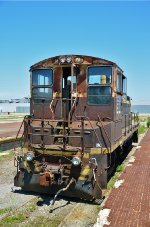 Title: LOCX 68 is going to Ohio Locomotive Works. 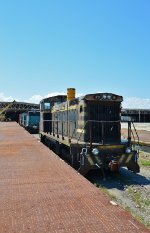 Title: LOCX 1264 & Co in storage. Title: Bits & pieces of the 365 are to be seen next to the storage line. Title: Looking back over the storage line. Title: LOCX 68 has quite a stack cap there.